Since the arrival of European settlers in the sixteenth century, America's population has grown to more than 310 million people and is expected to reach 400 million around the mid-2040s. Her lands have seen the rise of tens of thousands of cities; millions of homes, office buildings, and skyscrapers have been constructed, and rail and interstate highway systems now sprawl across the country. Over eighty thousand planes fly through her skies every day; her soils have been plowed repeatedly, and she has suffered from dust bowls, erosion, polluted air and water, and declining ecosystems. She is resilient, yet how much more can she take? 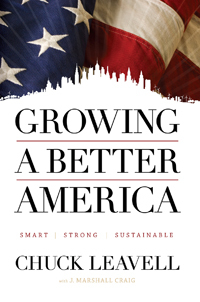 In his fourth book, Growing a Better America, commonsense environmentalist Chuck Leavell helps us understand how we can repair some of the damage we've done and how, in the future, we can balance our need for growth with our need for natural lands, green spaces, clean air and water, and a healthy lifestyle.